Boeing Commercial Airplanes, Seattle, Washington. 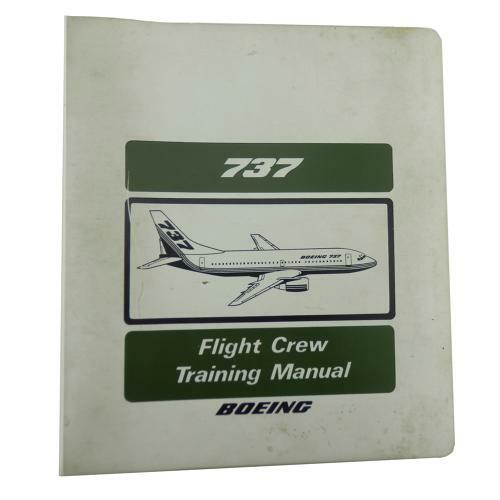 737 Flight Crew Training Manual. Document No. FCT 737 (TM), Revision 3, August 31, 1989. Ring bound folder providing information and recommendations on maneuvres and techniques. It is divided into three chapters : General information, Manual flight and Automatic flight. General information covers procedures and techniques which apply to both manual and automatic flight and are not associated with a particular maneuver. The manual flight chapter covers the procedures and techniques for each maneuver without the use of the autothrottle, autoplilot or flight director. The automatic flight chapter covers procedures and techniques for the use of the automatic flight systems. The cover is soiled, otherwise in very good condition. Stock code P23189.